You can wrap everything yourself and then serve it, or just place the skillet on the dinner table and have everyone make their own wraps. This is essentially what I did. It's more like a family meal this way. Heat up a large skillet over medium high heat. 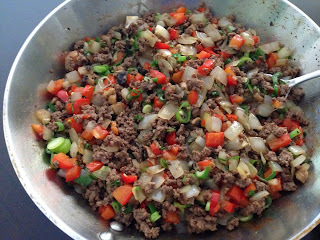 When the skillet is very hot (a water droplet would bounce and sizzle away), add ground beef. Season with salt and pepper. Cook until beef is no longer pink. Toss in bell pepper, onion, and mushrooms. Cook until onions start getting soft. Add garlic and soy sauce. Cook until garlic is fragrant. Stir in oyster sauce and green onions. Turn off heat. Season with more salt and pepper, if necessary. To assemble, lay a thin layer of lettuce leaves on a tortilla. Spoon about 1/3 to 1/2 cup of beef mixture into the middle. Top with as much hoisin sauce and Sriracha as you like. Fold opposite ends and roll into a small/medium wrap. Repeat with remaining filling. Enjoy with a cold glass of limeade or strawberry lemonade.